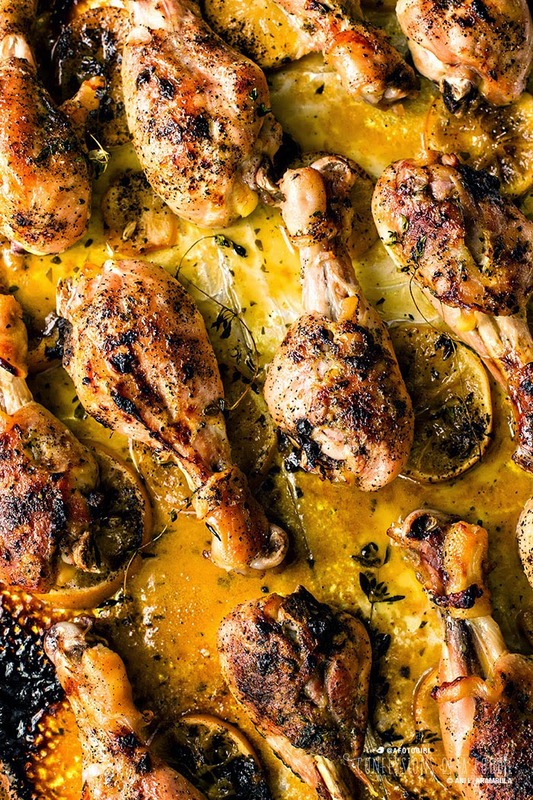 High heat roasted chicken legs are bathed in a limoncello and thyme infused sauce. No marinating needed and you can have dinner on the table in an hour. 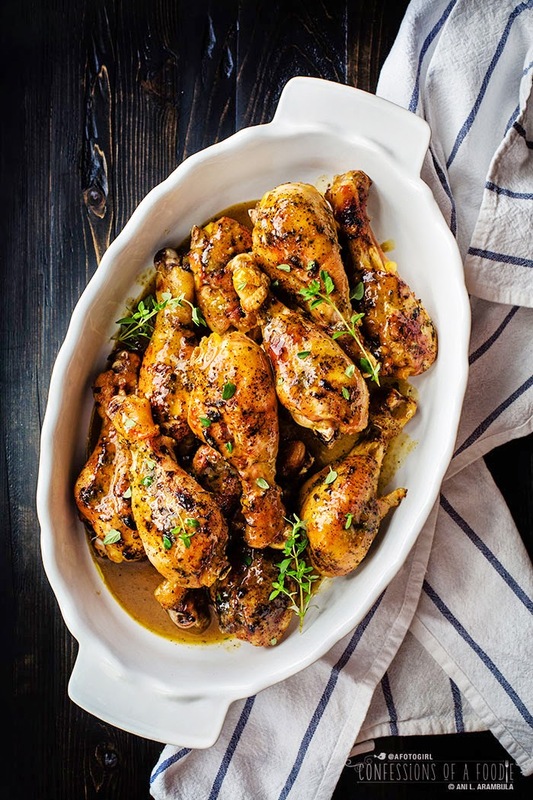 High heat roasted chicken legs are bathed in a limoncello and thyme infused sauce. No marinating needed, this dish is prefect for Super Bowl Sunday. Ever since my success with homemade limoncello this past summer, I've been wanting to share recipe ideas utilizing the bright, citrusy liqueur. With Super Bowl weekend just around the corner, I thought it was the perfect time to post my roasted limoncello chicken. Originally I had planned to make wings for this post inspired by a foodie friend's recipe for buffalo wings that I cooked and styled for this cover shoot. However, I was lucky in that the paper reimbursed me the cost of the party wings for the shoot. The money to cover expenses for this blog, however, comes right out of my pocketbook. And holy moly! 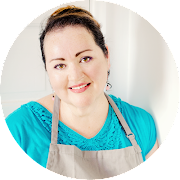 Making wings for game day – even for just a few friends – can get expensive! Especially since wings would be just one dish among many yet to plan for. Instead, might I interest you in making these beauties? 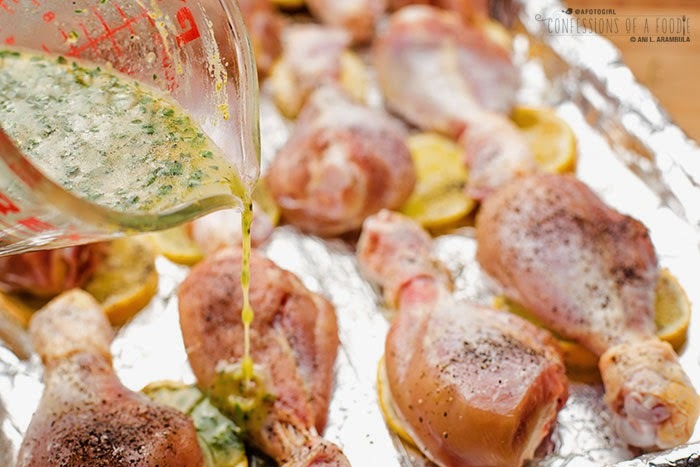 Roasted limoncello chicken legs. Chicken legs are half the price of wings but triple the size, making them much more filling and satisfying. Yeah, ok, so mini food is all the rage and no one can argue that they aren't cute. Certainly they aren't a choice that'll break the bank if you're attending a potluck and you're tasked with contributing just one dish. But if you're hosting a party and providing several dishes, why not make a statement while getting more bang for your culinary buck? I bought two packages of party wings (wings are cut for you and the wing tip is excluded from the package) for the photo shoot. It gave me about 24 pieces, only a third of which were drumettes which, truth be told, is the fun mini part of the whole wing experience. At $3.99 per pound, that ran me nearly $18 for just under 5 pounds. Sure, the suggested serving is three wings per person but c'mon! When have you ever only eaten just three wings? Even if your partaking of the rest of the bevy of appetizers, it's the fun mini protein that most people load up their plate with first. I bought a 5 pound family pack of chicken legs (13 pieces) at $1.99 per pound. That would have been just under $10. However, as is often the case for family packs, there was a manager's special going on the day I bought the chicken and all the family packs were $4 off. Now that makes entertaining all the more fun and affordable! To make these a little healthier, I removed the skin. I know, I know. But really? You're going to be indulging with all that fun party food anyway so why not make these a little better for you? Besides, removing the skin from dark meat really isn't a problem. You're still going to get juicy, delectable meat. Trust me. Chicken needs seasoning so at this step, your going to want to be generous with that kosher salt. A good amount of freshly cracked pepper is also a must. 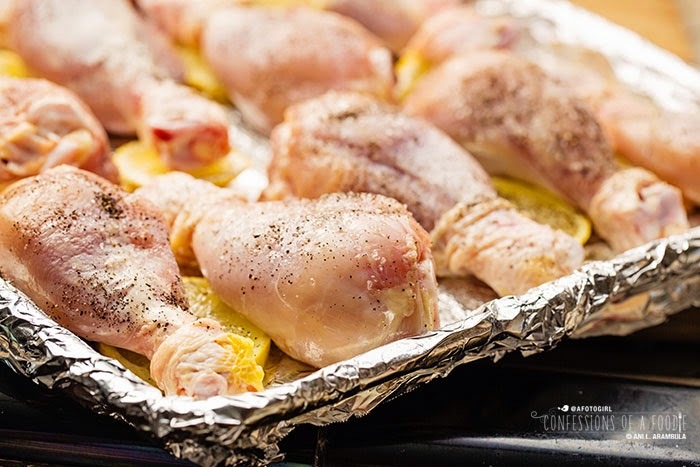 And might I suggest, cut two long pieces of foil, place them on top of each other, fold one of the long sides over twice to make a "seam" and the open it up and completely wrap your rimmed baking sheet. This is going to be roasted at a high heat setting and the limoncello is going to caramelize. If you don't protect your pan, you are going to have a real mess to clean up. I am totally obsessed with these living herbs. Have you bought them before? They stay fresh in the refrigerator well after normal packaged cut herbs have wilted and blackened. Once a week, I drip just a tiny bit of water on the root ball and I can normally keep them going for a good three weeks making them so much more economical than regular packaged herbs. We're using thyme in this recipe. It's a classic pairing with both lemon and chicken. We're layering on the lemon flavor in this recipe adding the zest of one lemon. As I've noted before, I love this microplane. I've used several different kinds but I prefer the control that this style affords me. 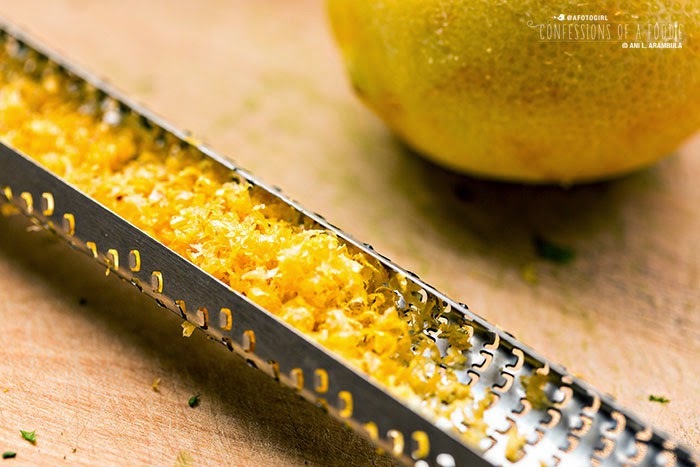 As a rule, when you see celebrity chefs zesting with it on TV, they are doing it so that the lemon is on top, the microplane under the lemon and the move the lemon across the microplane so that the zest falls directly into whatever pot or bowl they are adding the zest to. I used to do this, too, until I got tired of the precious zest going not only into the pot or bowl but flying all over the stove and countertop not to mention not being able to see where you're zesting and running the risk of going too far and getting the bitter white pith. So another tip for you: zest with the microplane above the lemon and instead of running the lemon across the microplane, run the microplane across the lemon, turning the lemon as needed to get just the gorgeous yellow skin. Besides being able to see where you're zesting, all the zest will remain between the lips of the microplane until you are finished. Then simply run a finger down the center of the microplane and under the lips to guide the collected zest into your pot or bowl. Minimal waste. Easy! Even though I've successfully reversed my diabetes diagnosis, I have stuck to my basic diet overhaul and for the most part, don't use refined sugar which includes white sugar, agave and those cute little honey bears. But sometimes, in cooking, I find I want just a hint of natural sweetness and honey is the flavor I'm wanting. Normal commercial honey is highly processed and heated, killing any of the trace nutrients and antioxidants found in the honey used by our ancestors. 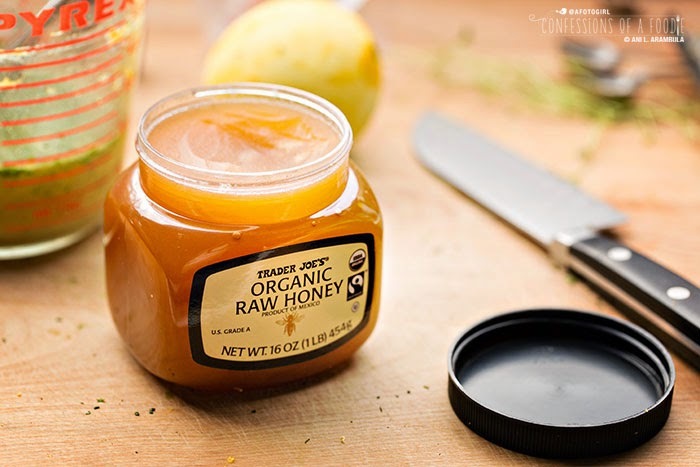 If I'm going to partake of this sweetener, I opt for organic raw honey and I use it only occasionally and in moderation since it is, still, primarily fructose and glucose. That said, I'm in love with this stuff. So good and truly, a little goes a long way. 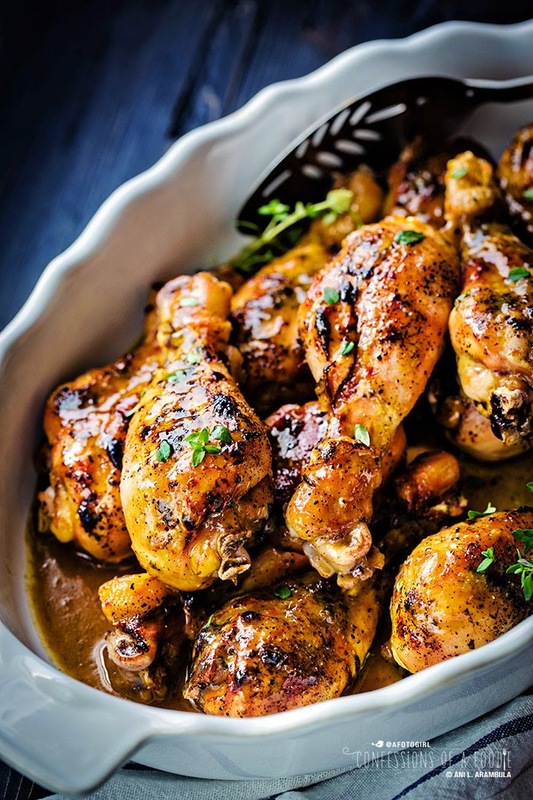 After the chicken comes out of the oven and you remove it to a serving dish and while the roasting pan is still hot, you're gonna add a little white wine to the pan and use a rubber spatula to loosen up all the charred juices stuck to the pan. 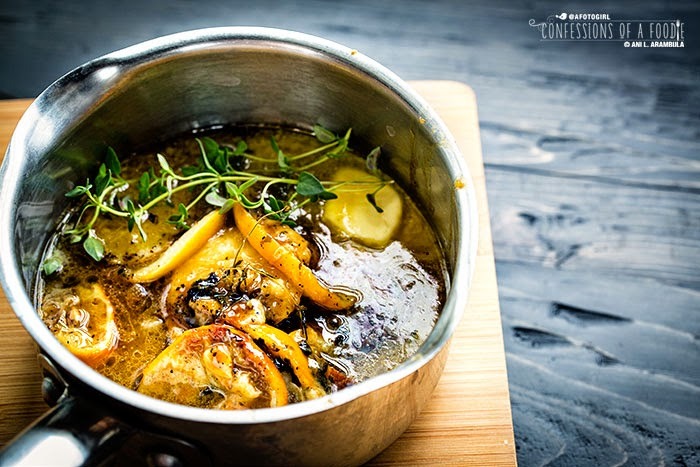 Then those juices along with the roasted lemons get's drained into a saucepan with fresh thyme and a pat of butter and ½ cup of chicken stock. This gets simmered down until it reduces by half. Then it goes through a fine mesh strainer and is poured over the chicken before serving. So have I convinced you to try making these yet? Whether you make these for Superbowl or not, they're gonna be a hit with whomever you serve them to. And bonus, they're even better the next day making them a great leftovers for lunch option. 1. Move a rack to the center of the oven. Preheat oven to 475 degrees Fahrenheit. Line a rimmed backing sheet with foil and spray with cooking spray. Arrange sliced lemons on sheet. 2. Remove skin from legs then rinse and pat dry. Arrange legs on top of lemon slices making sure legs aren't touching. Sprinkle all sides of the chicken with salt and pepper. 3. Whisk the melted butter, honey, limoncello, zest, lemon juice, salt, pepper, chopped thyme, garlic and mustard in a small bowl until thoroughly combined. Reserve 3 tablespoons of sauce, pouring remaining sauce evenly over chicken. Place chicken on center rack of oven and roast for 20 minutes. Evenly spoon the reserved sauce over the chicken and roast for an additional 20-25 minutes or until internal temperature reaches 165 degrees Fahrenheit (for an accurate reading, place probe in fleshiest part of the leg being careful not to touch or get too close to the bone). 4. 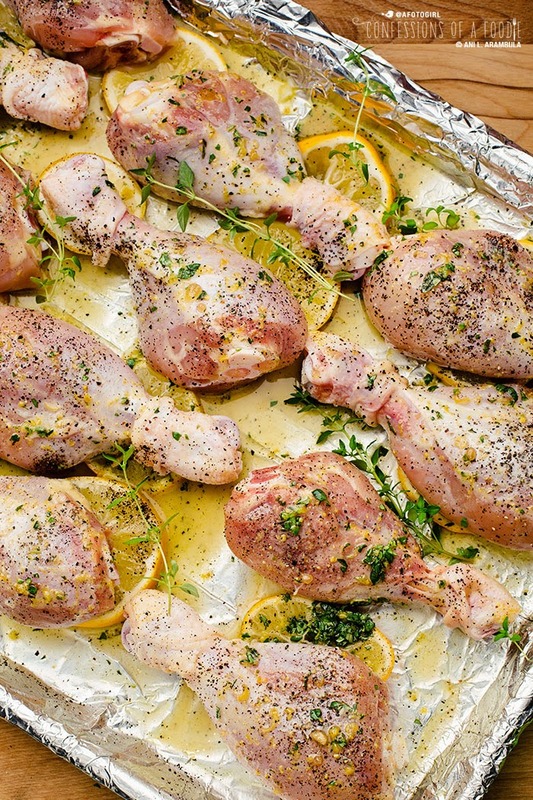 When cooked, remove chicken to a warmed serving dish or lipped platter. Immediately deglaze the baking sheet with the wine, using a spatula to lift up the dark caramelized bits. Pour the contents of the baking sheet into a medium saucepan. Add the butter and thyme sprigs; simmer, reducing the liquid by half. 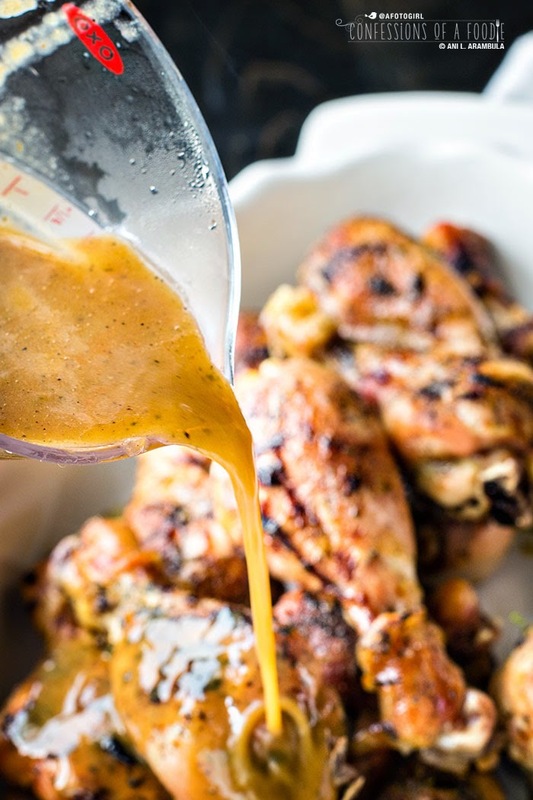 Pour the sauce through a fine mesh strainer into a large measuring cup, and just before serving, pour the strained sauce over the cooked chicken. 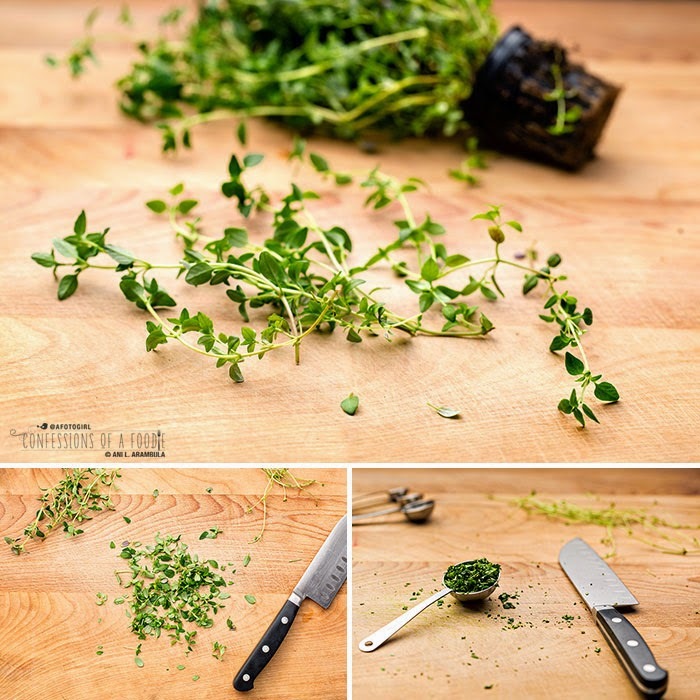 Optionally, garnish with chopped fresh parsley or thyme leaves to add a bit of bright freshness to the dish. Ani, these look amazing! I love the creative use of limoncello! Oh wow. 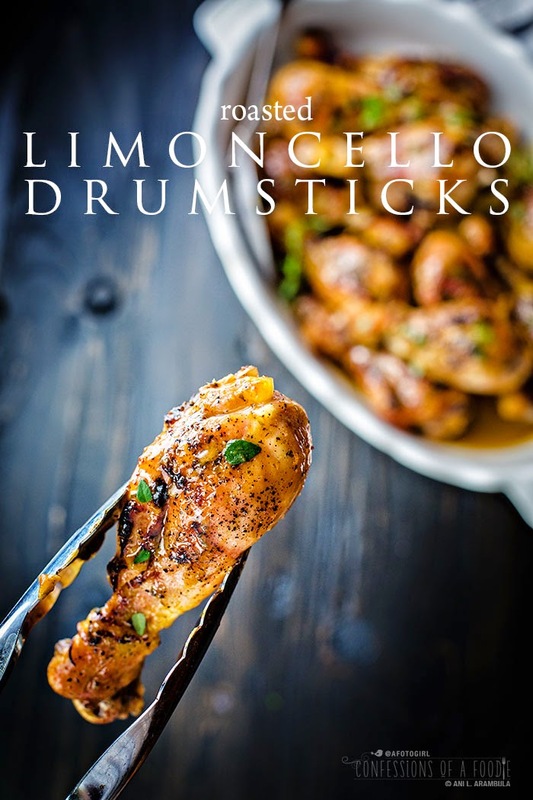 I love all things lemon and putting limoncello on drumsticks is brilliant! Bravo. I'm trying this one straight away. I would love to try this, sounds delicious. I am concerned if the foil might tear with the spatula and get pieces of the foil in the sauce but i guess we are straining so it is not a big concern.I am just trying to picture in my mind how that part of the step would unfold. Thank you for sharing. I already know it is going to taste good when I make it.